Project Professional can sync a list of tasks with SharePoint—without using Project Web App. Your team members can view the schedule and update their work in SharePoint, and you’ll see the changes in Project. And vice-versa. Tip: Got more than 100 tasks to sync? If so, expect things to go a little slower. The first time you sync will be slower than normal. If you have a lot of changes, a lot of custom fields, or a lot of tasks added or removed, that will also slow things down. These steps assume you have a project open in Project, but you haven’t made a SharePoint site for it yet. In Project, choose File > Save. Select Sync with SharePoint, and in the Sync with list, select New SharePoint Site. In the Project name box, type a name. In the Site Address list, add the address of the SharePoint tasks list that you will sync to. Note: At this point, don’t use an address that contains the name of the tasks list. Project adds that part automatically. Here’s what will happen: When you choose Save, a new SharePoint site is created for the project. Changes you make to tasks in Project are reflected in SharePoint, and vice-versa. If you have a lot of tasks, this may take several minutes. These steps assume you have a blank schedule open in Project, but all the tasks you want to sync to are on a SharePoint site somewhere. Note: What about syncing an existing project to an existing SharePoint site? This is not supported. You either need to have a blank project plan or a blank tasks list. Project will not merge two lists of tasks during the initial syncing process. Once you've set up the sync using the steps in this article, you can make changes to either list and the changes will be applied in both places. In the Sync with list, select Existing SharePoint Site. In the Site Address box, type the address of the SharePoint tasks list that you want to import. Note: Don’t use an address that contains the name of the tasks list. Project adds that part automatically. In the Tasks List box, type or select a name for the tasks list that you want to sync with your project. Here’s what will happen: When you choose Save, the tasks list in SharePoint will now appear in Project. Changes you make to the list of tasks in Project will be reflected in SharePoint, and vice versa. The table below contains conditions that might prevent Project tasks from syncing with a SharePoint tasks list. Syncing more than 1,000 tasks is not recommended. If you want to sync more than 1,000 tasks, consider breaking down your project into multiple projects, and then sync the projects separately. Projects with over 100 tasks will sync, but it may take several minutes. If a project plan doesn’t contain a field that is required in SharePoint, the plan won’t sync. Add the required field as a custom field in Project. Note: Required fields in SharePoint can vary, depending on how your organization has set up the tasks list. If you're not sure which fields are required, try adding a task to the tasks list on the SharePoint site. Required fields are marked with an asterisk (*). SharePoint fields don’t support formulas. Try removing the formula from the field in Project and then resyncing. Make sure that none of your summary tasks in Project contain any of these characters. These steps assume you have created a list of tasks in Project prior to syncing the task list to a SharePoint list. Choose Sync with Tasks Lists. In the Site URL list, select the URL name of the SharePoint site that contains the list that you want to sync to. Note: At this point, don’t use a URL that contains the name of the task list you want to use. In the Select an existing tasks list list, select the name of the SharePoint task list to which you want the project tasks list to sync. If you want to sync the Project task list with a new list in SharePoint, type a new name. A new task list will be created in SharePoint, and will become synced up with the one in Project. After the two task lists are synced, changes to one list will be reflected in the other. If changes are made to the two lists at the same time, a dialog box appears that prompts you to decide which version of the change you want to keep. Tip: After the two task lists are synced, within Project you can go the SharePoint version of the task list. Click the File tab, click Info. 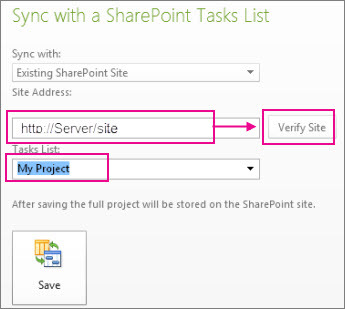 In the Sync to Tasks Lists section, click the link to the SharePoint site. These steps assume that you have created a list of tasks in SharePoint list, but have not created a corresponding one in Project. In Project, choose File to open the Backstage view. Choose Save & Send. In the Site URL list, type the URL name of the SharePoint site that contains the task list that you want to use. In the Select an existing tasks list list, select the name of the SharePoint task list that you want to export to Project. After the two task lists are synced, changes to one list will be reflected in the other. If changes are made to the two lists at the same time, a dialog box will appear that prompts you to decide on which version of the change you want to keep. Tip: After the two task lists are synced, in Project you can go the SharePoint version of the task list. Choose FileInfo. 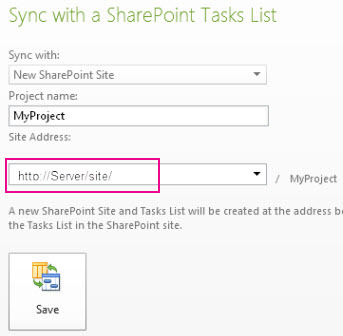 In the Sync to Tasks Lists section, click the link to the SharePoint site. The table below contains conditions that will prevent Project tasks from syncing with a SharePoint list. If the SharePoint list contains a field that is required, but the project plan does not contain the same field, then synching between the two lists will stop. Solution: Add the required field as a custom field in Project. WinProj has multiple resources assigned to a single task and SharePoint has specified there may only be one resource for that task. Look up fields contain values which are not of type string/text.